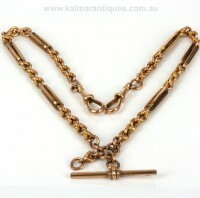 Antique rose gold Albert/fob watch chain. Product code: es3591 Categories: Sold Items, Sold Jewellery. However in the early 1900’s with the increase in popularity of wrist watches, the gentleman of the house put these chains down and started to wear the wrist watch and now years later woman wear these around their neck. And here is a fabulous example of a genuine antique Albert chain that is all original. So many of these chains are only half the length, or the Tee bar does not sit perfectly in the middle so it is great to get one that is all complete as well as being in perfect condition. Laid out end to end the chain measures 42cm and looks so elegant around the neckline as it is often worn today. The link design is just so attractive and made more elegant by the three long double bars on each side. Dating from the early 1900’s this is a wonderful example of a genuine antique Albert chain that is so elegant and refined.